Snowdonia is a spectacular place to visit and is one of the UKs top tourist destinations and according to Lonely Planet, number 4 in the World’s Top 10 Regions. For decades, the mountainous region was known for the simple pleasures of walking and fishing in the countryside, a place that welcomed tourists who just needed a peaceful break away. The lakes, rivers and the ocean provided a wealth of things to see and do. Now we have Zip World Fforest Coaster! Over the years, Wales and Snowdonia have seen a drop in the historical economic activity of mining and farming. Changes in the global economy have forced the people of Wales to think out of the box and develop new and equally sustainable sources of income and trade. The solution has been tourism and this has seen the already popular destination become even more popular. Now, the challenge is to further grow the popularity and find evermore reasons for people to come to one of the most beautiful places on earth. The challenge to attract tourists, not just the traditional walkers, kayakers, mountain bikers and climbers or simply those just looking to relax has begun, in the last few years a number of innovative attractions have been developed. Mines and mountain caves have been opened up for the public to enjoy, castles and other buildings of interest have been given a touch of Welsh magic and made even more attractive for tourists; Wales has got to grips with adventure tourism and doesn’t want to let go. Modern day lifestyles have had to be considered; people want a little more excitement yet they still want to get close to the natural beauty that makes Wales the destination that it is. Having fun has been the number one driver behind some of the latest attractions and fun is an understated way to describe the brand new Fforest Coaster that has opened up a short walk from us here at Bryn Bella. 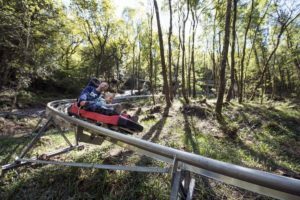 Zip World is renowned for turning nature into an experience both above and below ground, the highly innovative company has just opened the UKs very first Forrest Rollercoaster ride here at Betws-y-Coed within Snowdonia National Park. The Fforest Coaster is the only Alpine Coaster in the UK and is essentially a high-speed toboggan run on rails that races down the side of a mountain through the trees. This exhilarating family attraction has 35 sledges and can cater for 250 people who want to experience the ride of a lifetime. The Zip World Fforest Coaster embraces the need for fun and adventure that modern tourists and families demand whilst balancing it with the natural beauty of a Welsh mountainside. With breath-taking views and what feels like break neck speeds, screams of joy can be heard as people hurtle through the forest all year round. Kids from the age of nine can pilot their sledge that has simple controls for braking to ensure they go as fast or as slow as they feel safe to do so, a maximum speed limit is applied.